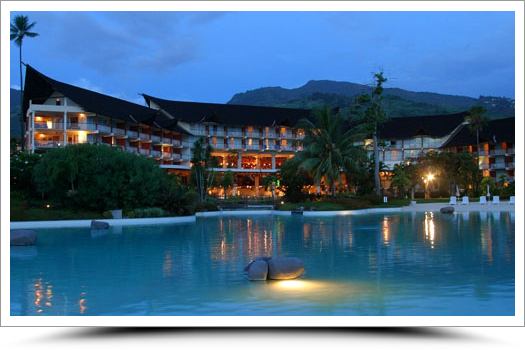 InterContinental Tahiti Resort has long been rated the top hotel on the island of Tahiti. It is located alongside the lagoon with a view of Tahiti’s sister island, Moorea. It’s the perfect place to begin a visit to French Polynesia. Nestled in a sumptuous garden setting coverning 12 hectares, the resort boasts two superb infinity pools and offers an extensive range of activities. The hotel is only a short 2 miles from the airport. One of the best hotels on the island of Tahiti but if you are moving along to other islands save your money on top room upgrades for Moorea, Bora Bora or Taha’a instead. Discover the captivating beauty and colorful culture of the Punaauia region, where dramatic mountains, waterfalls, and azure waters await. Le Méridien Tahiti is located in close proximity to many of Tahiti’s most popular attractions, with excursions available directly from the resort to the Caves of Maraa, Gauguin Museum, and the Seashell Museum. A broad range of activities are also available such as hiking and horseback excursions, safaris to the heart of the island, waterfall and canyon adventures, trips on the lagoon, and guided tours of cultural sites. With a modern European feel this makes a great stopover hotel or place to stay for a few nights to explore the island of Tahiti. 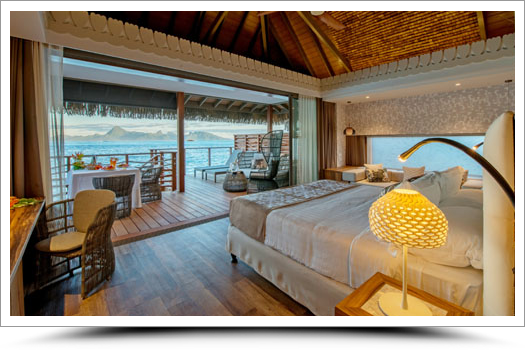 The Manava Suite Resort Tahiti is the premier Papeete resort for business and leisure travelers alike, offering 121 guest rooms ranging from superior rooms to multi-bedroom duplex suites and apartments. Designed by Tahitian architect/designer Bruno Hervochon, all guest rooms reflect authentic Polynesian décor while still offering contemporary amenities and the comforts of home. 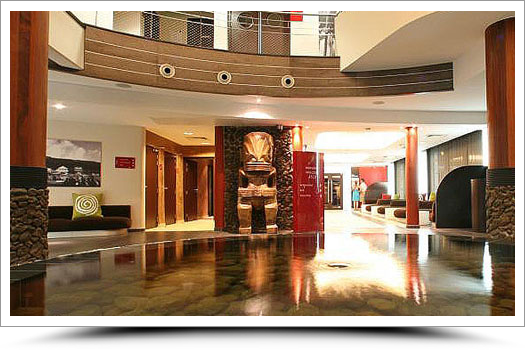 The four star resort encompasses five separate buildings, with the first housing the reception area, restaurant, meeting rooms and 12 guest rooms, and the additional four housing 109 suites on 3 floors. In addition, the resort features two bars, a restaurant, a boutique, a fitness center & spa and the island’s largest infinity swimming pool facing the lagoon and nearby island of Moorea. Great value at a solid 4 star hotel on the island of Tahiti. Larger suites are perfect for families and longer stays – some complete with kitchenettes. Featuring lush surroundings and beautiful waterfront views, our Tahiti resort hotel on Lafayette Beach is ideal for a French Polynesian honeymoon, vacation or business getaway. 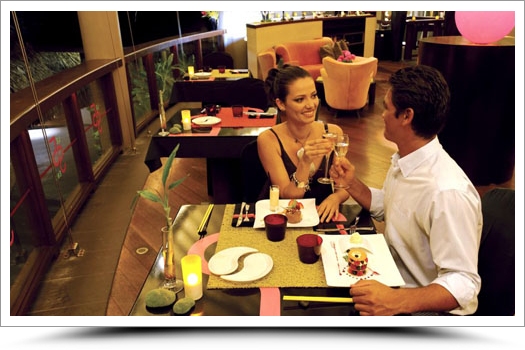 The Tahiti Pearl Beach Resort offers all the amenities expected of luxurious Tahiti hotels, including an infinity swimming pool, an on-site spa and a Business Centre. Our oceanfront resort on Matavai Bay offers warm island hospitality and a tranquil atmosphere, inviting guests to relax and unwind. Located on beautiful Lafayette Beach, the Tahiti Pearl Beach Resort boasts direct access to the tropical ocean waters of Tahiti. Hotel guests can water ski, snorkel or simply enjoy the beach. Our resort in Tahiti provides convenient access to some of the best local attractions, including the shopping and port districts of Papeete, the capital city. Resort offers a free shuttle twice a day into Papeete – take advantage and explore the market for some shopping.